Slammed within an inch of the ground and covered in fake patina, you might not like this 1968 Porsche, but chances are you will have an opinion about it. Selling later today on Ebay, this 911T "Outlaw" could be yours. 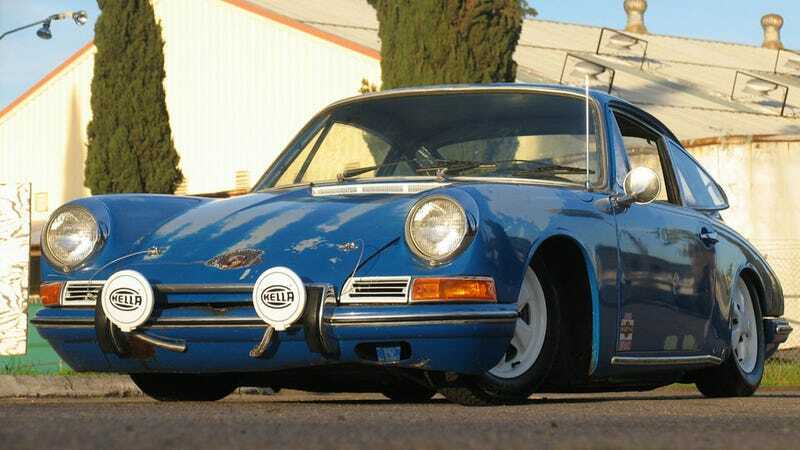 Already managing to draw the ire of many German car forums across the internet, this 1968 Porsche started it's transformation from restoration project to purist agitator when it fell into the hands of a California Volkswagen shop. This automotive "Love it or Hate it" has been the recipient of significant modifications since it left Stuttgart many years ago. "the entire frame/body of the car was removed and a one-off sub-frame was fabricated with 6 mounting points - very stiff and very light. The stock A arms were kept, along with stock torsion springs and strut assemblies. The strut assemblies were shortened approx. 4" and new late model lowered VW strut inserts were installed. The arms and torsion assemblies were brought in 10", and raised 6". Out back, the rear end was dropped approx. 6" using the stock arms and rotated, notched spring plates. A section of rear frame was notched to allow full movement of the rear suspension. Engine and transmission were raised approx. 3" for clearance." The extreme modifications to this car don't stop there, to replace the stock rusty floor pans custom floors were made, helping the low car gain a little ground clearance. The Porsche came to the shop without an engine. Instead of paying for a high dollar Porsche engine, a 1776cc Volkswagen Bug engine hooked up to a Bus transmission was dropped into place. The aging Gulf Blue paint was distressed and clear coated to give the car a faux-patina look. The interior is no frills at best, a mixture of original interior pieces, Dynamax soundproofing and bare metal. The finished product is a far cry from what you think of when someone says vintage Porsche. This may in part be due to the fact that besides the body shell, there isn't a whole lot left that is Porsche. While the narrowed front end and the fake patina aren't really our thing, it is neat to see a very different take on an old Porsche. Not a particularly rare model, this 911T with bad floors and no drive train likely would have ended up a parts car or a metal cube. Love it or hate it, the no reserve bidding ends this afternoon at which time this Porsche will have a new home. With the bidding at $5800 currently, it won't take a lot of green to own this low blue Porsche.